That outfit is awesome! 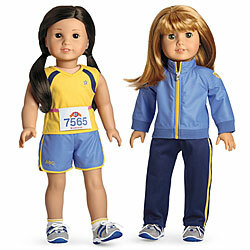 So much better than the cheerleader outfit my American Girl Doll had! That's outstanding. Your good example is setting her up for life. Happy birthday to your runnerd. So cute! My daughter got the same outfit for her doll for Christmas. She loves having her "race"
Wow that is the cutest thing ever that she wanted that. Love the look on her face. This is just awesome. Happy daughter bday! This is awesome but I can't let my daughter see! She is a little Runnerd too! (The other day she asked me how much longer I was going to be on the treadmill because she needed to workout too. lol)Little girls are the best!! !